The Limerick City Centre Tidy Towns Committee picking up their Bronze Award at the Failte Ireland Mid West and South West Region Tidy Towns Awards Ceremony on the 25 November 2017. Failte Ireland Mid West and South West Region Tidy Towns Awards Ceremony. Limerick City Centre Niall O’Callaghan, Supervalu, Maura O’Neill, Helen O’Donnell, Sharon Slater, Ann O’Malley and Pat Breen TD Minister of State for Trade, Employment, Business, EU Digital Single Market and Data Protection.Pic Arthur Ellis. This year’s SuperValu South West and MidWest Tidy Towns Regional Awards 2017 were presented Friday 24th November, at a prize-giving ceremony in Hotel Woodstock, Ennis, Co Clare. 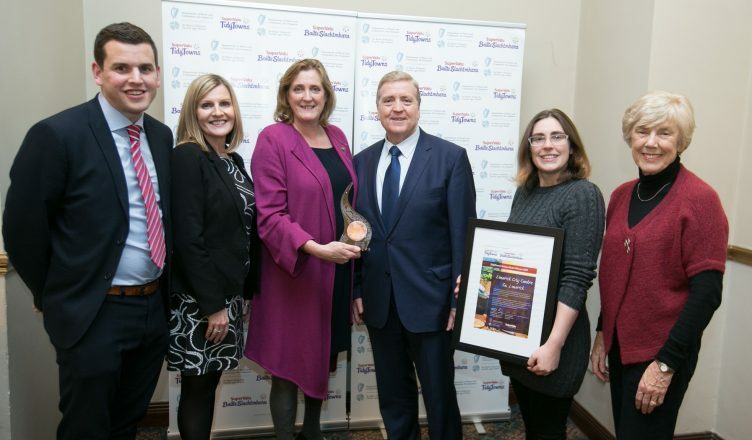 SuperValu TidyTowns winners were presented with their awards by Minister of State, Pat Breen, T.D., and Niall O Callaghan, Community and Sponsorship Manager with Supervalu, proud sponsors of the competition. Also joining the Minister on stage was Siobhan King of Fáilte Ireland. 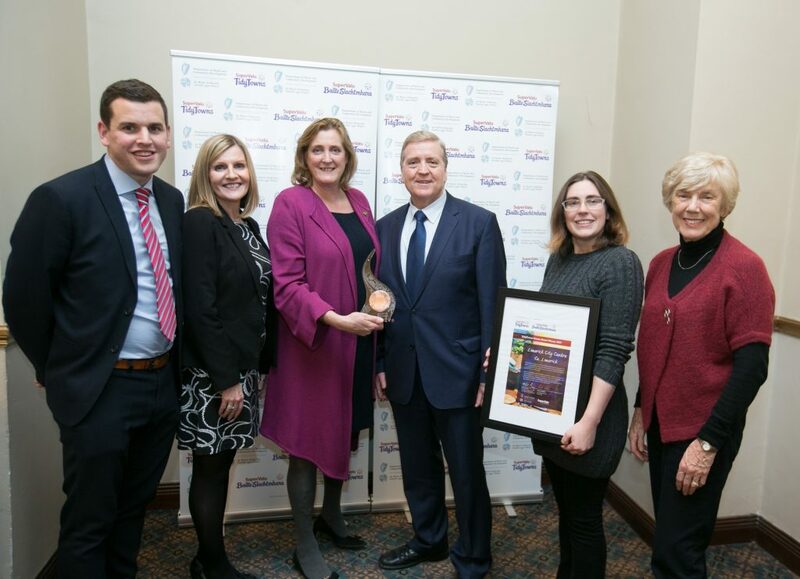 Ennis won the regional title, as well as Ireland’s Tidiest Large Urban Centre with Clonakilty winning the title of Ireland’s Tidiest Small Town. A full list of today’s prizewinners is attached. Niall O Callaghan, SuperValu Community and Sponsorship Manager said: At SuperValu we believe in building vibrant local communities and the SuperValu TidyTowns competition goes to the heart of what community is all about. The allocation of funding by Minister Ring to Supervalu Tidy Towns groups around the country in order to further improve their communities is a fitting gesture to mark the 60th anniversary of this competition. I have no doubt that the money will be a huge boost to the groups and will be put to very good use in towns and villages around Ireland. Interest in the SuperValu TidyTowns competition has been stronger than ever in recent years and with a record 870 communities entering the competition in 2017. The competition has been running since 1958 and is organised by the Department of Rural and Community Development. The competition has been sponsored by SuperValu since 1992.